As we head into the 4th of July weekend, hot dogs are everywhere. They're on our grill and on our plates. They're on our TVs (the annual hot dog eating contest on ESPN). And this being Serious Eats, they're on our mind. Let's discuss. We bring you Serious Eats' definitive guide to America's regional hot dog styles. Bacon-wrapped hot dogs are grilled, then nestled in steamed bolillo rolls and topped with pinto beans, chopped tomatoes, onions, mustard, mayo, and jalapeños. Other variations could include any of the following: shredded cheddar, queso fresco, cotija cheese, salsa verde, and guacamole. A favorite that hails from New York's North Country, Michigan red hots are steamed beef franks with a natural casing, served in a steamed split-top bun, and topped with a minced meat chili (no tomatoes or beans), chopped raw onions, and mustard. Some places, like Clare and Carl's in Plattburgh, NY, serve theirs in a New England roll, which has closed ends and is cut down the top. Similar to Michigans and Coneys, the New York System wiener joints can be found all over Rhode Island. Griddled natural casing all-beef hot dogs are served in steamed side-cut rolls with meat sauce, mustard, chopped onion, and a dash of celery salt. Olneyville's in Providence uses hot dogs that come in a long rope that's cut on the premises and a special spice mix for the meat sauce that can be purchased from its website. At most places, the chef will line up the "gaggahs" on his bare arms to load up the toppings. 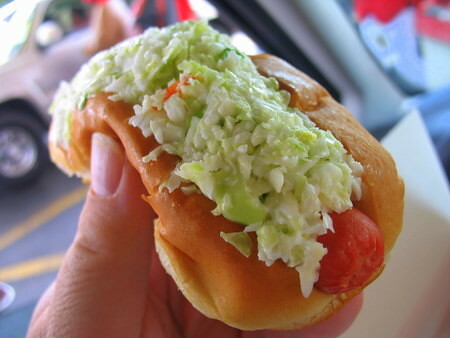 Hot dogs slathered with a sweeter, finely chopped, mayo-based slaw are popular in the South, where variations can include the chili-slaw (cole slaw, mustard, raw onion, minced all-meat chili) and BBQ slaw. Some places, like Nu-Way in Macon, Georgia, use red hots, while others may go for the all-beef with natural casings. In Rochester New York, hot dogs are known as "hots" and come in either red or white. Most hots are found on another Rochester classic, the garbage platean amalgam of hots (or burgers, sausage, whatever you please), potato salad, home fries, meat sauce, among others. White hots are normally made of a mixture of uncured pork, veal, and beef, while red hots can be made with pork, beef, or both. Zweigle's is best known in Rochester as the first to introduce the white hots in 1925 and makes both natural casing and skinless varieties. Also known as "red snappers," this dog gets its name from its neon colored casing, which has no effect on the taste. Some joints serve theirs grilled or griddled for the best snap in a toasted, buttered roll, while others, like Simone's Hot Dog Stand, go steamed in a steamed top-split bun. Go to Flo's red shack on Rt. 1 for a steamed hot dog (pork and beef mix) smeared with mayo, a dash of celery salt, and Flo's legendary secret relish (a dark, spicy, sweet and sour onion concoction that can be purchased online by the jarful), all in a soft steamed bun. Kosher dogs are all-beef and come either skinless or in collagen casing, while kosher-style dogs are stuffed into natural casing, which gives it that snap when bitten. According to Ed, you'll find the best kosher franks in the city at the Second Avenue Deli and at Ben's Best in Rego Park. Queens. As for the classic kosher-style, you can't go wrong at Katz's Deli, Gray's Papaya, or Papaya King, especially when griddled and topped with sauerkraut and a smear of mustard. Places in and around Newark, like Dickie Dee's and Tommy's, like to serve their dogs Italian-style (a.k.a. Newark-dogs): skinny all-beef hot dogs are deep fried and stuffed into a half- round of Italian bread (or sometimes "pizza bread"), along with fried onion, peppers, and potato rounds. Get your deep-fried dog in three ways at places like Rutt's Hutt: the "in and outer" (barely fried), the "ripper" (crinkly burst skin), or the "cremator" (well-done with crunchy crust). It's an ugly pork and beef frank in a steamed bun, but at Rutt's, you can cover it up with some of its sweet and spicy yellow relish. All beef dogs in a steamed poppy seed bun and dragged through the garden: minced raw onion, neon sweet relish, sport peppers, pickle spear, halved tomato slices, yellow mustard, celery saltand of course, no ketchup. From Detroit to Tulsa, Coneys are a favorite: small-sized, all-beef natural casing dogs served in steamed buns and topped with minced meat chili, mustard, and chopped onions (order the "loaded" and you'll get shredded cheddar, too). Depending on where you are in the Midwest though, they can come big or small, grilled or steamed, with "coney sauce" that ranges from the drier side to the wet. Arguably Washington D.C.'s signature dish, a half-smoke is like an over-sized spicy sausage and can be filled with a pork/beef mix or all-beef. Some places steam them, but the legendary Ben's Chili Bowl serves its chili half-smokes by grilling the snappy links, putting them in steamed buns, and topping with chili, mustard, and chopped raw onions. Pink's chili dogs are legendary: all-beef, natural casing, and topped with onions, mustard, and a slather of meaty chili in a steamed bun. Variations include: the foot-long jalapeno dog; the Ozzy Spice Dog with a spicy Polish sausage, Nacho cheese, American cheese, grilled onions, guacamole and chopped tomatoes; and the bacon chili cheese dog. One of the most eaten stadium dogs out there, Dodger dogs are skinless foot-long hot dogs made of pork and set in a steamed bun. Dodger fans can get theirs steamed or grilled and if they can't make it to the park, the official Farmer John Dodger Dogs can be found in some supermarkets in the area. Native to the Island, but seemingly more gimmicky than an authentic representation of Hawaiian cuisine, the puka dog is a grilled Polish sausage (or veggie dog, if you prefer) served in a large bun that's had a hole (or "puka") pushed into it by a contraption that also toasts the inside. You can choose from a variety of "garlic lemon secret sauces" that ranges from "mild original" to "habenero hot hot," tropical relishes, and lilikoi or guava mustards. Traditional toppings like ketchup and Dijon are also available. When I was there this spring, I got the Polish sausage with hot sauce, mango relish, and lilikoi mustard. It was great, but I wasn't sold on the price ($6.25 for one puka). Who knew that Connecticut was the mecca of hot dog variations? There's the split and grilled frank topped with homemade condiments at Super Duper Weenie's in Fairfield; the chili and Orleans dogs from the Top Dog truck in Portland; Rawley's "works" dog in Fairfield that's a natural casing deep-fried, griddled, then topped with mustard, relish, sauerkraut and crunchy bacon chunks, all in a toasted bun; and the list of beloved franks goes on. It's a state that deserves a hot dog tour in itself. I always liked sausage dogs better. Brats, to be precise - real brats, not that Johnsonville garbage. Rutts Hut in NJ RULES! Those are some yummy pictures! I wouldn’t mind trying that Arizona one in the bowl looking bun and that Hawiaan puka dog! Damn ... I’m gonna have to call the wife and see what she thinks about hot dogs for dinner tonight. My vote — bacon-wrapped cheese dogs, maybe Ketchup/Mustard or Heinz 57 Sauce. Its a thing of beauty. Goodness, I can feel the cholesterol coursing through my veins just looking at the photos! I have my own variation. A cooked (grilled, boiled, nuked, etc.) hot dog wrapped in a corn tortilla that has been slightly “cooked” over the electric stove burner. Wrap it up with shredded cheddar, minced green onions, and mustard. Put a layer of crushed pineapple (drained) at the bottom of the bun; next, add a layer of onions; top the pineapple and onions with a grilled all-beef hot dog; then pour your favorite BBQ sauce atop the dog. Connecticut also invented the hampburger, has the best apizza (Sally’s on Wooster St. in New Haven) and has one of the more credible claims for inventing the grinder/submarine sandwich. hampburger shuld be hamburger. No one has invented the hampburger yet. And “shuld” should be should. I hate my keyboard. I need my ‘80’s vintage clicky IBM back. They have a stand at National's Stadium. The line is always long. Dodger fans can get theirs steamed or grilled and if they can't make it to the park, the official Farmer John Dodger Dogs can be found in some supermarkets in the area. I can here Vin Scully advertising Farmer John's now. I don’t understand the difference between the “Michigan Red Hot” and a coney. Except that it’s from upstate New York. It sounds like someone went to southeast Michigan, discovered the coneys in Flint and Detroit, and then took the concept back to NY and popularized it there. I had a few slaw dogs myself over the 4th. I added some home-made bbq sauce. I've always called ‘em “Elvis dogs” just because I'm sure the King would have approved. I can remember as a child having hot dogs at Howard Johnson’s. One of the things I loved about them was the bun. Think it’s called a New England style bun (like the one in picture #6). They’d brush melted butter on them and then grill them-—boy were they great. Unfortunately we don’t have that style bun in California, at least in our area, and I sure miss them.